Lush Purple all cotton tote bag with monogrammed name or initials perfect for the beach, weekends away, books or shopping. This all cotton tote bag is 30x40cm with a 9cm gusset so it holds plenty of goodies. Features long handles so it can be fashionably hung over the shoulder. Personalised with beautiful embroidered name in a font style and thread colour of your choice. A lovely gift for birthdays, Mothers Day, Christmas, anniversaries. Useful as a shopping bag, beach bag, school bag, music bag and sports/dance bag! 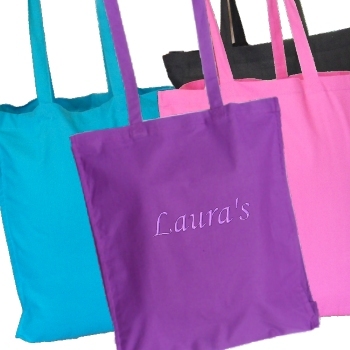 Please allow at least 48 hours for us to embroider your customised tote bag. Size: 30 x 40cm portrait style.